17 January , 2015 Father General arrived the Vietnam Province to participate in the commemoration of the 400th anniversary of the arrival of the first Jesuit in Vietnam. On 25 April, Father General left Rome for South America. He will return on 12 May. The first stop of the visit was British Guyana, Venezuela and Cuba. During the second half of this visit, Father General took part in the 28th Meeting of Latin America Provincials (CPAL). From 14 to 17 January, Father General has visited the Province of Korea. This is a young and growing Province of the Society: its 174 members have an average age of only 43.06. From Korea, Father General has travelled to Dili, East Timor, to attend the Assembly of Major Superiors of the Jesuit Conference of Asia Pacific. Father. General used to be the President of the Conference. From 29 September to 12 October Father General visited the USA. Father General was able to meet the men in Studies, a selected group of students from Loyola Academy, the Board Chairs, Presidents, and Provincials of the Association of Jesuit Colleges and Universities (AJCU) before celebrating the Eucharist with Jesuits from the Chicago-Detroit and Wisconsin Provinces. During his stay in the Colombian Province from August 11 to 14, he went to the cities of Cartagena, Bogotá and Medellín. On August 15 he participated in the Alumni Congress held at the Colegio San Ignacio de Medellín, and on August 16, he travelled to Ecuador and stayed in the city of Quito. On August 19 and 20 he visited the city of Guayaquil. Along with several meetings with Jesuits, with students from our schools, with apostolic collaborators, friends and benefactors of the Society, his trip included meetings with the Apostolic Nuncio and Archbishops of each place visited. From 7 to 9 June, the Austrian Province of the Society celebrated the 450th anniversary of its foundation in 1563. Father General participated in some of the festivities. These included workshops, conferences, and meetings. Father General, in the presence of Jesuits, friends and collaborators, guests and representatives from University, Church and State, presided at a solemn Mass in St Stephen's cathedral. Father General visited Southern Africa where he participated in the meeting of the Conference of Jesuit Major Superiors of Africa and Madagascar (JESAM) which was held in Lusaka-Zambia from the 8th to 13th of April 2013. It was the first time for Father Nicolás to visit the Zambia-Malawi Province. From 4 to 6 April Father General paid a visit to the confreres of the German Province gathered for a symposium in Vierzehnheiligen, a site of pilgrimage. The evening of April 4 and the morning of April 5 were devoted to meetings and exchanges between Father General and the brethrens. Before the Sunday mass in St. Michael, the Jesuit church in Munich, Father Nicolás was able to pray on the tomb of Blessed Rupert Mayer in the Bürgersaalkirche, near St. Michael. Father General participated in the 25th Assembly of the Conference of Latin American Provincials (CPAL) in Lima (Peru) from October 30 to November 3. During and after the assembly, he visited the different apostolic sectors, groups of Jesuits, and lay people of the Province of Peru and attended the Signing of a University Consortium. On November 5, Father General left for Bolivia. There he participated in the Congress of the International Federation of Fe y Alegría. He, later, visited Puerto Rico. Fr. General was on a seven days visit to Poland from 23rd to 30th September 2012. He was accompanied by Fr. Severin Leitner, the new Assistant for the Central and Eastern Europe.The slide show gives some glimpses of his visit with Jesuits and collaborators in Poland and the memorial services of Father Peter Skarga and Father Jan Beyzym. He also spent few moments with the official media, the Magis youth movement and the Jesuit school children in Poland. Fr. General, accompanied by Frs. Adam Zak and Joaquín Barrero, had been visiting Romania from19th to 21st May, 2012. His trip included three important events namely the visit to JRS (Jesuit Refugee Service), the 10 anniversary Eucharist in Cluj and the meeting with the Jesuits in Cluj. Fr. General's visit to India continued into the two provinces of Ranchi and Hazaribag as well. There he met many young and old Jesuits, various collaborators and religious groups, learned about various apostolates of the provinces, and also had a chance to converse with the two local bishops. Father General’s visit to the South Asian Assistancy from February 15 to March 1st gave him an overview of the various activities of the Jesuits in the central Zone in India, where the universality of the Church is manifested through the integration of tribal cultures in the simple faith practices of the local people. This was Fr. General's first official visit to Jamshedpur province meanwhile he also attended the Jesuit Conference of South Asia held at XLRI Jamshedpur. From 18 to 28 January Fr. General was in Asia. 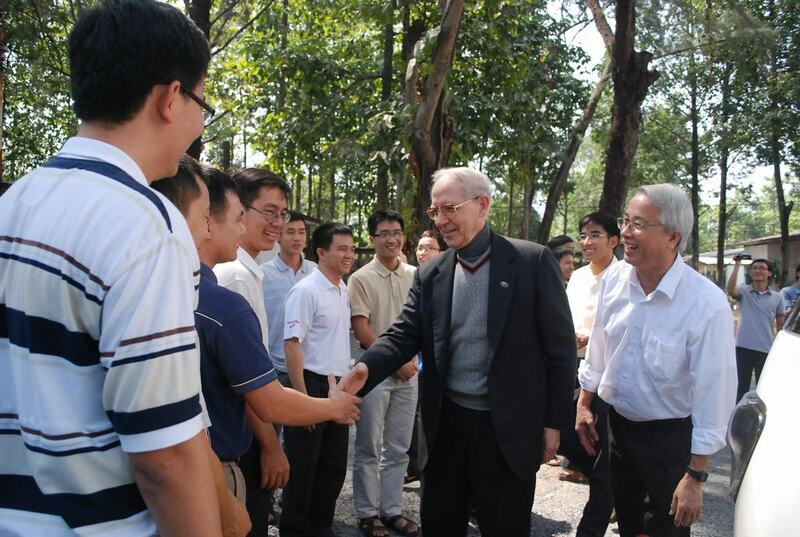 The first stop of the trip was Vietnam, where he met the Jesuit community, lay collaborators and local bishops. Then he moved to Australia. It was the occasion for him to participate in the JCAP (Jesuit Conference of Asia Pacific). In Australia, Fr. Nicolás visited many of our institutions also. From 7 to 10 November Father General visited the Province of Betica. Starting from Las Palmas (Canary Islands) he paid a visit to the Colegio San Ignacio, the Loyola Centre and the installations of Radio Ecca. Then he moved to Granada and the Faculty of Theology. The trip ended in Seville where he visited the ETEA Foundation, the future Universidad Loyola de Andalucía, the SAFA and Loyola Foundations and the Colegio Portaceli. From the 29th of September to the 2nd of October Father General has visited the Jesuits of the Province of France. 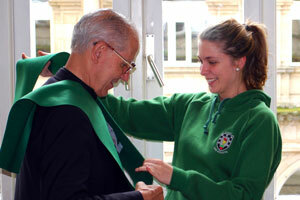 He paid a visit at the Centre Sèvres, meet the scholastics in formation in France and participated at a Province Day. On the 6th and 7th of August Father General participated at the start of Magis 2011 in Loyola (Spain) where 3000 young people began their preparation for the World Youth Days in Madrid. From July 22 to the 29 Father General has visited the two Provinces of Canada. He participated at the Congress: Jesuit Relations: 1611 - 2011 - Remember. Renew. Without Counting the Cost." He took part in a contemplative pilgrimage with other Jesuits and friends and received a guided tour of Ste Marie-Among-the-Hurons, the village that was rebuilt according to the style of the ancient indigenous houses. After his visit to the Province of Central Africa, Father General has visited Madagascar to participate in the General Assembly of the Provincials of Africa and Madagascar (2 - 6 May). From May 7 till May 11 he visited Antananarivo (novitiate, scholasticate, High School), Bevalala and Ambiatibe. From 26th April to 11th May Father General is in Africa and Madagascar. In the Province of Central Africa (D.R.Congo) which is celebrating this year 50 years of its erection, he has visited the apostolic works of Kinshasa, Kimwenza and Kisantu. From 21 - 28 March, Father General visited Syria, Lebanon and Turkey. In Syria he met Jesuits at Damascus and Homs where he accepted the last vows of Father Nawras Sammour. In Lebanon he met with several religious leaders as well as the President of the Republic. He has been welcomed at the college of Jamhour and at the University Saint-Joseph. In Beirut he has participated in the celebration of the last vows of Dany Younès and Nabil-Ghaly. Finally he visited the Jesuit community of Ankara, Turkey. After his visit to the Karnataka Province, Fr. General visited on March 8 and 9 Calicut (Kerala Province), where he met different groups (KER Jesuits, Coordinators, friends and benefactors) and the Juniors of the Common South Zone. On March 9 and 10 he finished his India travel in Kolkata for the celebration of 150 years CCU Province. From February 27 to March 12 Father General has visited India. During his stay in Bangalore (Karnataka Province) he participated at the meeting of the Major Superiors of the South Asian Region. The days before the meeting he met candidates at the Candidate House, Saint Joseph College, the Jesuits of the Bangalore region and the Indian Social Institute. He visited also the regional theologate and the novitiate. In Mangalore there was a meeting with over 600 staff and alumni/alumnae of St Aloysius (an umbrella of 19 educational institutions). From the 2nd to the 5th of December Father General has visited Egypt. He met the novitiate, the formatores to religious life and the Coptic-Catholic Patriarch, the teachers, the students and the alumni of the Holy Family College. Finally he participated at a Regional day of the Egyptian Jesuits. From September 24 to the 27 Father General has visited the two Provinces of Belgium. There was also a meeting with the Jesuits and and their co-workers working in the five common European apostolic works of the Society in Brussels. From the 4th to the 10th of July Father General visited the Russian Region. In Novosibirsk he participated in a meeting of Jesuits of the Region. In Moscow he met with representatives of the Department of External Relations of Orthodox Russian Church and there was a reception at the St. Thomas Institute, the theology, philosophy and history faculty run by the Jesuits in the Russian capital. 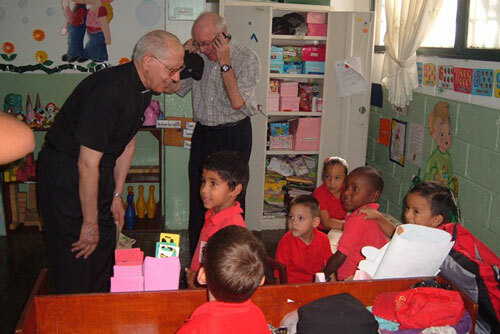 At the end of his Central American Trip, Father General visited the Dominican Republic and Haiti. In Haiti he visited some Jesuit Communities and places where Jesuits are helping the refugees from the earth quake of last January. After his visit to Mexico, Father General was in El Salvador, Nicaragua and Panama, from the 24th till the 27th of April. He met the Jesuits and their friends in the three countries, visited some schools of Fe y Alegría and inaugurated the new site of the Xavier College in Panama. From the 19th till the 23rd of April Father General visited Mexico. The main purpose of his visit was participating in the World Congress of the Jesuit Higher Education, but he also met Jesuits and friends of the Society in Mexico City and Guadelajara and had a meeting with indigenous people in Bachajón (Chiapas). On February the 11th and 12th Father General visited the small Jesuit Community of Lahore in Pakistan. They paid a visit at two schools. Fr. General had also a meeting with Jesuit candidates. 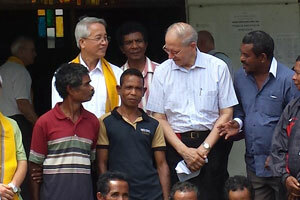 From the 6th till the 9th of February Father General visited the Jesuits of the Colombo, Galle and Kandy districts. He paid a visit to the Tulana Centre of Research and the Tertianship. He had different meetings with Jesuits of the Ministry Commission, of the North and East zone, of the erstwhile war zone and with scholastics and young priests. After his visit to South Africa Fr. General went to Kenya for the celebration of 25 years Hekima College. He visited also AJAN and a lot of projects in Kibera and Kangemi, inaugurated the Institute for Peace Studies and a Spirituality Centre in Mwangaza, where he met the members of the East African Province. Father General visited South Africa from the 11th to the 13th of December. After a visit to Apostolic Nuncio Mgr. Green in Pretoria, he has been brought to Soweto, he blessed and placed the first stone of the new Jesuit Residence in Johannesburg and met the Jesuits of the South Africa Region and a group of JRS Collaborators. Father General visited Slovenia from the 6th to the 8th of November. After courtesy visits to the Archbishop and the Apostolic Nuncio, he has met the Jesuits of the Slovenian Province at Saint Joseph Spirituality Center. During the afternoon a Eucharistic celebration has taken place at Dravlje church to commemorate the 40th anniversary of the Province. On 15th October the provincials, vice-provincials and regional superiors of Europe began to arrive in Malta for the 15th General Assembly of the CEP. They were also joined by Father General and the three European Assistants from Rome. On the last day Father General addressed the assembly and shared his reflections. From the 4th to the 9th of September Father General visited Croatia and Hungary to celebrate the 100th anniversary of the birth of these two Provinces. In Croatia he visited Zagreb where he participated in a number of meetings and gatherings. The visit to Hungary was centered in Budapest and Miskolc. Father General Nicolás continued his first visit to the United States as superior general of the Jesuits by attending events at Loyola Marymount University in Los Angeles and then flying up to Sacramento where he continued to acquaint himself with Jesuit apostolates. Then he went to the University of San Francisco campus for further meetings. Father General Nicolás visits the California Province as it celebrates the 100th anniversary of its founding. The former superior general of the Jesuits bids a warm farewell to the community which supported him for the 25 years of his service. The newly elected Superior General of the Jesuits, Father Adolfo Nicolas SJ, offers his inaugural Mass of thanksgiving at the Gesu church in Rome. Four days of prayer and consultation—known as the “murmuratio”—preceded the election that took place on Saturday, January 19. Father Adolfo Nicolás of the Japanese Province was chosen to head the Society of Jesus. The delegates of GC 35 accepted the resignation of Father Peter-Hans Kolvenbach SJ, as Superior General of the Society of Jesus. This historic step set the stage for intense days of prayer and consultation as the congregation members sought to find God’s Spirit leading them to the right person to succeed Father Kolvenbach. Delegates began their work with a solemn celebration at the mother church of the Society of Jesus in the heart of Rome. Cardinal Franc Rodé presided at the Mass which featured a choir led by Father Vlastimil Dufka SJ. The Chiesa del Gesù in Rome filled with Jesuits and friends on Nov. 9, 2008 as Father General Adolfo Nicolás presided at a Mass sponsored by the Jesuit Refugee Service in honor of its founder, Father Pedro Arrupe. The event also marked the formal opening of a photo exhibition showing the 30-year history of the JRS. Visit this site: detailed on this page buy viagra online tescos you can try here.